Isotonic drink with Maltodextrin, Minerals and Vitamins, with Creatine and Ginseng. 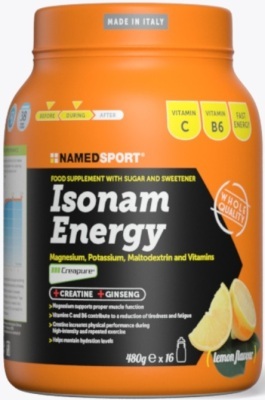 Food supplement in powder form, designed for the preparation of an isotonic drink (314.24 mosm / L). Magnesium and Potassium helping muscle functionality. Ginseng has tonic effect and is recommended in cases of physical and mental fatigue. Creatine (3g / d0se) increases physical performance in case of endurance activities, of high intensity and short duration. Thanks to its special blend of Carbohydrates (maltodextrin and dextrose 6% p/v), which are assimilated by the body at different speeds, Isonam Energy has an osmotic pressure identical to that of plasma and guarantees a rapid passage through the gastric system and rapid assimilation into the intestine. Isotonic drinks play a positive role in sustaining performance in extensive exercise, especially in endurance. With 100% pure Creatine Creapure® quality (3g per serving). Potassium plays a role in muscle functionality. Vitamin C and Vitamin B promote energy metabolism. Ginseng can have a positive effect on feeling fatigued. Dextrose, Maltodextrin 21%, Creatine monohydrate, acid: citric acid; Flavour: Red orange; Sodium citrate, colours: curcumin, beetroot red; Potassium citrate, Magnesium citrate, Sodium chloride, Vitamin C(L-ascorbic acid), anti caking agents: silicon dioxide, calcium phosphate ; sweetener: Sucralose; Ginseng (Panax ginseng) root standardised extract, Vitamin B6 (pyridoxine hydrochloride). The recommended daily intake (30g equal to 1½ scoops), should be dissolved in about 500ml of water to provide a carbohydrate and electrolyte solution. Take before, during and after training. Suggested use: the carbohydrates and electrolytes solution (314,24mOsm/Kg) contributes towards hydration (increasing water absorption) and maintenance of endurance performance during prolonged exercise. 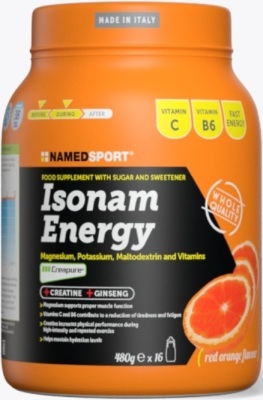 *Magnesium contributes to normal electrolyte balance and, together with Vitamin C contributes to the reduction of tiredness and fatigue. Ginseng can help reduce physical and mental fatigue. Creatine improves physical performance in case of repetitive, high intensive and short exercises. The beneficial effect is obtained with a 3g Creatine daily intake. Warning: food supplements should not be considered as a substitute for a varied and balanced diet and a healthy lifestyle. Not suitable for children. Do not use for an extended period without medical advice. Do not exceed the recommended daily intake. Keep out of reach of children under three years of age. For adults only. Do not use during pregnancy. Storage conditions: store in a cool, dry place. The best before date applies to the product if stored correctly in sealed packaging. Dispose in an environmental friendly way after use.